Filled with plot twists and turns, "Break No Bones" keeps the reader guessing until the final page. In our new book club selection, a woman finds freshly buried skeleton in the midst of a Native American burial ground. In Break No Bones, bestselling novelist Kathy Reichs’ famed forensic anthropologist Temperance Brennan teaches an archaeological field class on an island off the coast of Charleston, South Carolina. While excavating the site, Brennan and her students find a body buried in a two-year-old shallow grave. Emma, the county coroner, and Wilbourne, a feisty, interfering newspaper columnist, join Brennan in a race to discover the identity of the deceased. The trio seeks to discover why the body wasn’t given a proper burial and if this death has any religious connections. They also want to know why Dupree, the builder and engineer who owns the site, wants to start construction so quickly. Throughout the novel, countless secrets are revealed about every character, including the local sheriff. The plot twists and turns keep the reader guessing until the final page. 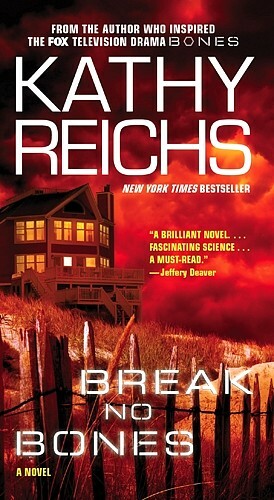 With Break No Bones, Reichs pens a literary rollercoaster that will garner new fans and please old ones. Populated with quirky, authentic and very human characters, this novel is a fascinating and intricately plotted addition to the Bones franchise. About the author: A Chicago native, Kathy Reichs is a world-renowned forensic anthropologist who taught FBI agents how to detect and recover human remains, identified body parts in her Montreal lab, and consulted for the Office of the Chief Medical Examiner in North Carolina and for the Laboratoire de Sciences Judiciaires et de Médecine Légale for the province of Québec. Reichs is the producer of the hit Fox television series, Bones, which is based on her work and bestselling novels. She currently divides her time between Charlotte, North Carolina and Montreal, Québec. Visit her Website online, or follow her on Facebook and Twitter, for more information. Read excerpts from novel or critical reviews.